In February 2019 we had a garlic tasting on Livingseeds Farm. We ran a workshop and had over 40 delegates on a course, they started the day off doing a raw garlic tasting. 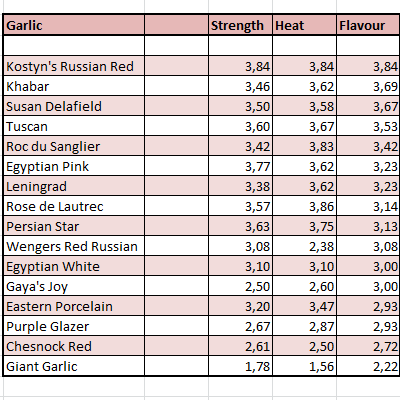 We used a very specific process to taste the garlic, and below are the results of their efforts. The garlic was rated on a scale of 1-5 and these final scores have been filtered purely on the flavour aspect. We did include the other two categories for your interest. If you want to know how we taste our garlic, WATCH this video. Garlic has a very specific planting window that needs to be adhered to. If you plant at the wrong time of the year you will not have the best results. We start supplying garlic from the end of January every year. Please sign-up to our newsletter to get a heads-up on garlic (and other) planting seasons. Let me also answer a common question that I get, as to why the garlic that you buy from your friendly green grocer does not grow. China is the world’s leading exporter of garlic with over 75% of the world’s production coming out of China. Most garlic on the shelves in imported from China, to be imported into South Africa this garlic needs to be irradiated this is to ensure that no live soil borne pathogens are carried into the country, and planted by a gardener looking to get some free garlic the following year. The process of killing off any potential soil borne pathogens also destroys the viability of the garlic you have bought. We have a special contracts in place every year for local garlic growers to grow out A grade garlic seed for us. This allows us to supply you with top quality garlic cloves that will grow and produce stunning garlic for your own consumption. As of 2019 all garlic will be sold in whole heads and not broken up as in previous years. The reason for this is simple, our tests have shown that garlic stored as whole heads last longer and produce a better quality "garlic seed" for planting. Our "clove count" per head is based on an average and may not be exact on a single head. We give an approximate clove spread in each description. Leningrad is a porcelain hardneck variety that was originally collected from Belarus historically ..